Epic highlights of the 2018 RORC Season's Points Championship. Winning the Jazz Trophy for first overall in IRC was the Army Sailing Association's X-41 British Soldier, the first Armed Services team to win the championship since it was established in 1999. British Soldier took part in 11 races, winning the championship in the very last race, with crew members ranging from Private soldiers, through Sergeants, right up to Colonel. Five different skippers were in charge during the campaign: Andrew Britton, Will Naylor, Phil Caswell, Paul Macro and Donall Ryan. The 2018 RORC Yacht of the Year, winning the Somerset Memorial Trophy was Matt Allen's Ichi Ban. Matt's Australian team won the Brisbane to Gladstone Race, the Rolex Sydney Hobart, and the Sydney Gold Coast Race. Ichi Ban's series of results, in the three major Ocean races in Australia, has never been matched. On Sunday, January 14, 2019, the US Sailing Team and Olympic Development Program athletes were joined by local and foreign sailors and volunteers who participated in the US Sailing Coconut Grove Coastal Clean-Up. The event was organized by US Sailing in partnership with VolunteerCleanup.Org and was sponsored by World Sailing. Upwards of 100 individuals collected over 850 pounds of trash from the mangroves lining Kennedy Park and Prime Point Marina. The athletes also took part in a workshop specifically designed to help identify how to become ‘change makers’ and reduce plastic pollution. Getting back to my roots today with a nice paddle cleanup. This one goes out to my friend Stephanie Vollack who needs some good vibes and karma points for extra luck and health to come her way. 30 gal bag of crushed beer cans from the garbage cans at Monument Island (surprisingly clean) and 40 pounds of trash from the mangrove side where trash washed up. Meet the finalists for US Sailing's 2018 Rolex Yachtswoman of the Year awards - Carmen and Emma Cowles, Daniela Moroz, and Paige Railey. US Sailing videos above and below published Feb 20, 2019. Meet the finalists for US Sailing's 2018 Rolex Yachtsman of the Year - Zeke Horowitz, Jud Smith, and Will Welles. Alex Thomson Racing video above published Feb 11, 2019: Now we're fully into the new year, we've had a good chance to look back what an awesome year 2018 was!!! An Italian cat, an American mule and a British pocket rocket are breaking new territory in the quest to create an extraordinary new generation of machines for the 36th America’s Cup. World Sailing Show video above published Feb 12, 2019. First finishers in Antigua: Maserati Multi 70 skippered by Giovanni Soldini (ITA) crossed the finish line of the RORC Caribbean 600 at 20:49:00 AST on Tuesday 19 February 2019 in an elapsed time of 1 day, 06 hours 49 minutes and 00 seconds, taking Multihull Line honours and setting a new Multihull Race Record in the 11th edition of the race; beating the previous record by just over one hour. The extraordinary events surrounding the battle for Multihull Line Honours will be remembered for years to come. Just 48 hours before the start of the 2019 RORC Caribbean 600, Jason Carroll's MOD 70 Argo (USA) capsized at high speed in training. It seemed impossible that Argo would be racing, but after a monumental effort by the sailing community in Antigua, Argo's crew and shore team, Argo miraculously made the impossible a reality. The team came in just 7 minutes behind Maserati. RORC video above published Feb 20, 2019, © Acquafilms Antigua/RORC. 2019 RORC Caribbean 600 UPDATES: LIVE Tracker and Results. David and Peter Askew's American Volvo 70 Wizard has won the 2019 RORC Caribbean 600 Trophy, scoring the best corrected time under IRC. Wizard put in a near faultless performance to complete the 600 mile non-stop race in 43 hours 38 minutes and 44 seconds. In the early hours of Thursday 21 February, after two and a half days and nights of intense competition and over 600 miles of racing, it all came down to just a few minutes. Catherine Pourre's French Class40 Eärendil won Line Honours for the Class40 Division for the second year in a row. Record for Maserati Multi 70 and Multihull Line Honours: Maserati Multi 70 skippered by Giovanni Soldini (ITA) crossed the finish line of the RORC Caribbean 600 at 20:49:00 AST on Tuesday 19 February 2019 in an elapsed time of 1 day, 06 hours 49 minutes and 00 seconds, taking Multihull Line honours and setting a new Multihull Race Record in the 11th edition of the race; beating the previous record by just over one hour. Monohull line honours for Wizard: David & Peter Askew (USA) racing their Volvo 70 Wizard have taken Monohull Line Honours in the RORC Caribbean 600 crossing the finish line on Wednesday 20 February at 07:08:44 AST in an elapsed time of 1d 19h 38m 44s. Wizard has set the bar for the overall win under IRC for the RORC Caribbean 600 Trophy. Early arrivals in Antigua + interviews with some of the first finishers in the 11th edition of the RORC Caribbean 600; including Class40 winner, Catherine Pourre - Eärendil (FRA); Wizard - Line honours monohull, Volvo Open 70 - David and Peter Askew (USA); Superyacht & largest boat in the race, Nikata, Greg Slyngstad's Bieker 53 Fujin (USA) successful return after her capsize in the race in 2018; Shannon Falcone's Dna F4 Falcon (ANT) and Multihull winner, John Gallagher on Gunboat 62 Chim Chim. See also 2019 RORC Caribbean 600 Class40 showdown video--"An epic finish is on the bill for the Class40 fleet with just 16 minutes separating the leading three yachts. Aymeric Chappellier's Aïna Enfance Et Avenir is just in the lead, in his rear view mirror Chappellier can see Catherine Pourre's Eärendil and Luke Berry's Lamotte - Module Création blast reaching at 20 knots in hot pursuit"--and the Class40 Hydra at Nevis video. Blast Off for the RORC Caribbean 600--The 2019 RORC Caribbean 600 kicked off in spectacular conditions off the south coast of Antigua with the magnificent fleet starting the 600 mile non-stop offshore race in bright sunshine, full-on gusting tradewinds and two-metre high waves. The 11th edition of the race featured 76 starting yachts from 20 different countries.--RORC video above published Feb 18, 2019. 75 yachts are about to embark on the 11th edition of this epic 600 nautical mile race around 11 Caribbean islands, starting and finishing off Fort Charlotte, Antigua on Monday 18th February 2019. RORC video above published Feb 17, 2019. Official website: caribbean600.rorc.org. Some of the high profile sailors participating (pdf). The 11th edition of the RORC Caribbean 600 starts from Antigua on Monday 18th February 2019. The 600nm course circumnavigates 11 Caribbean Islands starting from Fort Charlotte, English Harbour, Antigua and heads north as far as St Martin and south to Guadeloupe taking in Barbuda, Nevis, St Kitts, Saba and St Barth's. See Notice of Race. RACE RECORDS: Multihull record (2016) Lloyd Thornburg, Phaedo3, MOD70 (USA) 31 hours, 59 minutes, 04 seconds. Monohull record (2018) George David, Rambler 88, Maxi (USA) 37 hours, 41 minutes, 45 seconds. The fastest sailboats in the world set against the iconic backdrop of Sydney Harbour made for an unforgettable inaugural SailGP event. Plus a fairytale ending to the weekend as Australia SailGP Team pulled off a decisive win on home waters with Australian fans lining the harbor. SailGP video above published Feb 16, 2019. Australian pro surfer Sally Fitzgibbon at day 1 of Sydney SailGP, taking in all the action from the water. Naturally she was cheering for home team Australia SailGP Team led by Tom Slingsby. SailGP video above published Feb 15, 2019. An introduction to SailGP, which kicks off with its first event in Sydney, Australia--World Sailing TV video above published Feb 14, 2019. About SailGP: On 03 October, 2018 SailGP set out to redefine sailing with the launch of its new global racing league: five grands prix featuring six national teams on identical wingsailed F50s – the world’s fastest, most technologically advanced catamarans. Spearheaded by Larry Ellison and Sir Russell Coutts, in season one, SailGP will bring electrifying inshore racing to fans in Sydney; San Francisco; New York; Cowes, U.K.; and Marseille, France, as world-class crews compete for the championship trophy and a $1 million purse. SailGP video above published Jan 21, 2019: A look inside the final stage of making the supercharged F50s: assembly and launch. The launch of the first F50 in Marsden Point, NZ, in October 2018 was the culmination of months of tireless work by SailGP designers, boat builders and shore crew. Here are the highlights of the first leg of The Tour in Muscat! Cheminées Poujoulat team is on top of the leaderboard. Oman Sail video above published Feb 9, 2019. First launched by Oman Sail in 2011, EFG Sailing Arabia – The Tour has showcased the appeal of Oman as an ideal winter sailing destination to an international audience, and also helped reignite the Sultanate’s long maritime heritage. In its relatively brief history it has earned a global reputation as a dynamic and high-calibre sailing event that attracts world-class professional sailors and keen amateurs alike. All have embraced an event that stretches each team to the extreme, testing skills, adaptability and endurance. EFG Sailing Arabia – The Tour is once again the opening event of the 2019 Diam World Tour, which will continue with the Tour Voile and Grand Prix Pacifique Des Jeux, with the possible addition of the Nastro Rosa Italian Tour event to the calendar. Miami, USA welcomed 662 sailors from 60 nations for the second round of the Hempel World Cup Series. Look back on what happened on the water. World Sailing TV video above published Feb 8, 2019. See also Hempel World Cup Series Miami 2019, Jan 27 - Feb 3, LIVE Feed. World Sailing TV video Feb 3, 2019: 49er silver medallists this year in Miami, Dylan Fletcher-Scott and Stuart Bithell, will be competing in the inaugural Sail GP season as part of the Great Britain SailGP team. But how exactly will they balance their Olympic campaign with this new venture? World Sailing TV video Feb 2, 2019. World Sailing TV video Feb 3, 2019. World Sailing TV video above published Feb 3, 2019. Sailnet.com." - The world's largest online sailing community"
Gabart wins Vendee in record time - French sailor Francois Gabart wins the Vendee Globe solo around-the-world yacht race in a record time. 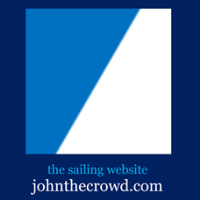 Sailing News - Your source for sailing headlines. © 2011-2018 Expri Communications LLC All Rights Reserved. Contact: email@expri.com. Powered by Blogger.